The chart below shows the proportion of males and females in Malaysia who commonly do physical activity in 2010. Summarise the information by selecting and reporting the main features, and make comparisons where necessary. The bar chart compares the proportion of male and females of differing age groups who frequently undertook physical activity in 2010. Overall, while the Malaysian population keeps fit in general, a higher proportion of women than men exercised in 2010, with some further differences between age groups. Middle-aged females were the most likely to work out, while for men, those aged 15 to 24 tended to do the most physical activity. By contrast, around half of all women in all age groups reported keeping fit, especially those aged between 35 and 64 at around 53%. The exception was the youngest age group in which only 47.7 percent of women exercised compared to 52.8% of men. Similarly, for people 65 and over, just approximately 47% of both sexes were recorded regularly working out. Use “compare” to directly state the comparison your description will make between the two genders. State “proportion” since the word “percentage” was used in the question. Use overall, taken as a whole, or on the whole to begin your overview. The main trend is that more than fifty percent of the Malaysian public keep fit, though more for women than men. State the high and low results if relevant to later description in body paragraphs. Contrast the standout data value for younger men (under 24) with the general trend for older men. Compare women with men in second body paragraph. Younger women exercised less than men, so include this comparison. Compare both sexes over 65 together. 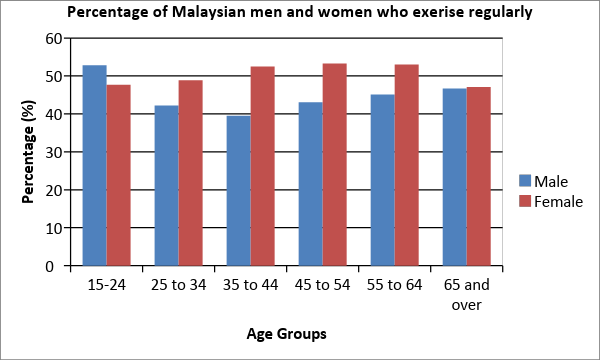 The bar chart is compare the proportion of male and females of differing age group which frequently undertook physical activity in 2010. Overall, while the Malaysian population keeps fit in general, higher proportion of women than men exercised in 2010, with some further different between age groups. Middle-aged females were the most likely to work out, while for men, those aged 15 to 24 tended to do the most physical activity. By contrast, around half of all women in all age groups reported keeping fit, especially those aged between 35 and 64 at around 53%. The exception was the youngest age group in which only 47.7 percent of women exercised comparing 52.8% of men. Similarly, for people 65 and over, just approximately 47% of both sexes are recorded regularly work out. By contrast, around half of all women in all age groups reported keeping fit, especially those aged between 35 and 64 at around 53%. The exception was the youngest age group in who only 47.7 percent of women exercised compared to 52.8% of men. Similarly, for people 65 and over, just approximately 47% of both sexes were recorded regularly working out. Look at both genders. Who exercises more: men or women? This is your overall trend. Now consider age groups. Which age group for women exercises the most and the least? Which for men? Do any of the age groups share similar results that will help you to group them together?